The heritage of the South Staffs district and anywhere else I fancy! Cannock Chase Colliery Co. Ltd.
Locomotives acquired by NCB after Nationalisation. For Nos. 6 – 8 see Cannock & Rugeley Coll. Cannock Chase Colliery Co. Locomotives. The Cannock Chase Colliery Co. bought 5 engines from the Beyer Peacock Company between 1856 and 1872. These were all saddle tanks with an 0-4-2 wheel arrangement favoured by the CCCC. The first loco was named ‘McClean’ after the founder of the company and was number 28 of 1856, acquired new. 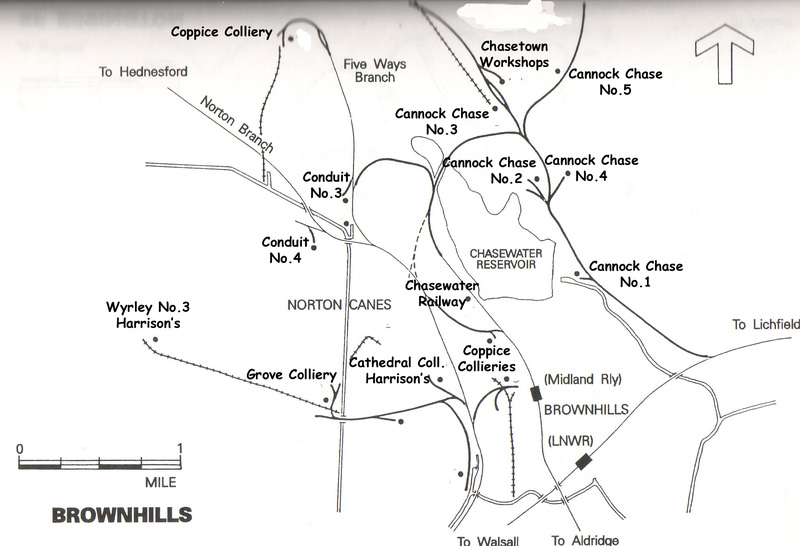 Worked at the Coppice Colliery in 1949 and finally scrapped by the NCB at Chasetown in 1956 – 100 years old. Next came the original ‘Alfred Paget’ another 0-4-2ST No.204/1861, acquired new, scrapped by NCB at Chasetown circa 1952. ‘Paget’ was the family name of the Marquis of Anglesey, one of the major land-owners in the district, and Chasewater Railway has kept the name – now on a Neilson engine. ‘Chawner’ was next on the list, 0-4-2ST No.462/1864. Acquired new, scrapped by NCB at Chasetown in 1949. Chawner was the name of McClean’s partner in the company. ‘Brown’ came next, 0-4-2ST No.794/1867, acquired new. Substantially dismantled in 1926 and some parts utilised to maintain the existing fleet. The rest was scrapped. John Nurthall Brown was Manager and Chief Engineer of the company around the late 1860s. No-one seems to have a picture of this loco. The final Beyer Peacock was ‘Anglesey’ 0-4-2ST No.1211/1872. Acquired new, scrapped by NCB at Chasetown in 1951. Named ‘Anglesey’ after the Marquis. No.6 0-6-0ST was a Sharp Stewart loco 2643-1876 acquired new, scrapped by NCB at Chasetown in 1952. No.6 worked with a four wheeled wagon as a tender and was used on the longer haul duties such as to Nos. 9 and 10 pits. ‘Griffin’ an 0-6-0ST Kitson 5036-1913, acquired new, transferred to Walsall Wood Colliery by NCB 1953 – still there in 1957 – since scrapped. ‘Foggo’ was an unusual engine, 0-4-2ST being built at Chasetown in 1946 from spare parts supplied by Beyer Peacock and other spares accumulated over the years from other locos. The name came from the General Manager at the time – M.J.Foggo. 75070 An 0-6-0ST Robert Stephenson and Hawthorn loco 7106-1943. A standard War Department ‘Austerity’ (LNER Class J94) acquired from the War Dept. in December 1946. Still at Chasetown 1957 – from Cannock Central Workshops 19-4-1963 to Littleton Colliery as their No.8 – scrapped on site, 1968. It is a pity that there is no photo of locomotive “Brown”, as it is named after my great great grandfather. His name was actually John Nurthall Brown, not Newland. He was succeeded as Manager of the Colliery by his son James Newland Brown. I would like to make a model of the loco – do you know whether plans of the Beyer peacocks are available anywhere? I can’t find any kits for these locos. Good to hear from you – also quite a coincidence as I had only finished another post which mentions ‘Brown’ last night and I have not yet published it, so you had me guessing for a while. I don’t think that kits are available but if you are ambitious enough, drawings of the original Beyer Peacock engine are avalable from Manchester Science Museum. These are of the engine in its original form – 0-4-0 before Mr. McClean added the trailing wheels. Hi, I am currently researching an ancestor who I believe worked as a wagon builder for the cccc ltd. in 1911, Just wondered if you have any details regarding the daily routine of such a profession and if you had any photos etc. The Beyer Peacock 0-4-2ST used at Cannock Chase Collieries was used by other imortant customers such as the GWR and the Swedish Government. A fine 1861 built example, “Thor” survives today in that country’s National Collection and should be seen by any prospective modeller. It is a great tragedy that none of the Cannock specimens survived. Hi Mark, thanks for the comment, I’m glad to hear that one of the locos has survived. I was told some time ago that ‘McClean’ came close to being preserved, but it was not to be. Would have looked good around her home lines at Chasewater! A side elevation Ahrons drawing of GWR 342 (Beyer Peacock 27 of 1856) was originally published in “The Locomotive” magazine and was reprinted in RCTS “Locomotives of the GWR Part 6” opposite page F7. This locomotive was originally owned by Chester Station Commissioners and did not enter GWR stock until 1865. Although the RCTS voulume states that the engine was built in the 0-4-2ST illustrated, is this known for certain, given that ‘McClean’ (the next engine) is known by photographic evidence to have been built as a 0-4-0ST? Was it simply inferred from the GWR data? In addition to ‘Thor’, a modified example of the same 0-4-2ST specification, built to 5ft. gauge, survives in the Finnish National Collection but this has closed-in splashers. The 0-4-2ST class remained the standard Beyer Peacock ‘small tank’ until the late 1870s (one loco at least was built as an 0-6-0ST for the Marquis of Bute’s Railwayb by the simple expedient of replacing the trailing truck bya coupled axle), being succeded by the larger 0-6-0ST design best exemplified by the LSWR ‘Saddlebacks’. This class was destined to inherit the curse of the Cannock Chase & Wolverhampton locos, with an ex-LSWR example (3334) being laid aside for preservation and later scrapped, a sister engine being scrapped in Australia in 1961 and an updated 1896 version being scrapped in colliery ownership as late as 1964! Cheers Bob. We’ve got a short piece of the cable and a couple of bricks in Chasewater Railway Museum. According to the excellent book on the Cannock Chase Colliery Company published by the Cannock Chase Mining Historical Society, a Temple in London beat the Church to getting electric light first! I am currently making a virtual model of McClean that will run in Microsoft Train Simulator. Is there anyone who would remember what colour these locos were painted? Great Central Railway, Loughborough, Leics.